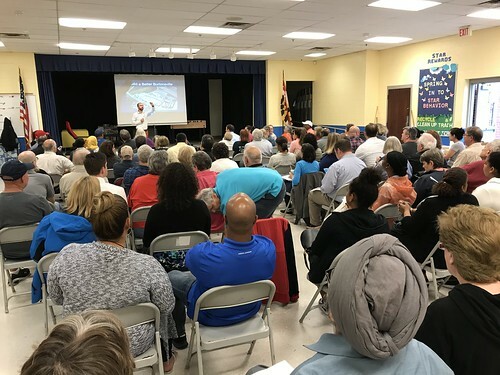 East County residents gathered this month at a workshop on the future of Burtonsville Crossing. Photo by the author. These efforts will help make our communities safer, give people more and more reliable ways to get around, bring new life to our older neighborhoods, and provide crucially-needed housing and economic opportunities for our growing population. I’ve offered my time and advice to these folks, and consider them my friends, but otherwise I can’t take much credit for these efforts. And that’s the best part! I’m excited that there are so many other leaders in this community, because together we can do so much more. The crucial part about these projects is that they’re bringing out people who don’t look like the “usual suspects” who get involved in Montgomery County affairs: young people and families, people of color, first-generation Americans, women, queer people, and people from underprivileged backgrounds. Judging from what we know about early voting, these groups are starting to make themselves heard. This is a sea change in Montgomery County politics, as the conversation often seems to be dominated by people who seek to maintain the status quo, or worse, to stand in the way and look backwards—circumstances that don’t really benefit anyone. It shows that when you fight for positive and constructive change—when you try to shape where we’re going while making sure that everyone here has a chance at a better life—people respond. Today is the primary election, which in this heavily Democratic county basically decides who will take office this fall. Having watched the campaign for the past two years, I feel like this election reflects a reckoning for our county that’s been a long time coming: despite our progressive reputation, our county remains a deeply stratified place, where the opportunities and prosperity we have to offer aren’t always available to everyone. From a slowing economy to the suburbanization of poverty to resegregating schools to high housing costs, there are some big things we have to confront. It is easy for some people here to overlook that, and it is easy to make our reputation a powerful weapon to distract from or shut down any conversation about changing these circumstances. The brunt of these issues will always fall hardest on historically marginalized groups, and there is no better way to silence members of those groups than by telling them everything is fine. A community is not something we are, it’s something we do, every day. For 12 years now I have tried to “do” community. And I’m humbled to see so many of you stepping up to “do” community as well. I hope you’ll keep it up. Keep showing up to meetings, keep speaking out on social media, keep making yourself heard, even if some people don’t want to hear it. And, of course, I hope you vote today. Your presence in this room can be a radical act. But only if you show up. Endorsements in county and state races from Greater Greater Washington, which has been working to make this region a better and more equitable place for over a decade and whose editorial board I'm on. Endorsements for county and state races, as well as school board, from the LGBTQ Democrats of Montgomery County. And you can see me talk about the election results tonight on Montgomery Community Media, either on Channel 21 if you have cable, or online at www.MCMLive.org.